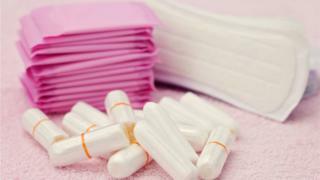 Women and girls in hospital who need sanitary protection will be offered free tampons and other products, NHS England has said. From summer, patients in England will be able to ask for pads and tampons when they need them, free of charge. The move comes after the British Medical Association argued it was inconsistent for hospitals to hand out razors for men but not tampons. NHS England said it meant patients could avoid unnecessary embarrassment. NHS Chief Executive Simon Stevens said it was “absolutely right” that everyone had access to the essentials of daily life during their time in hospital and it would leave people to focus on their recovery. In February, the BMA said two in every five UK hospital trusts and health boards did not give sanitary products to patients who needed them, or only in emergencies. Dame Parveen Kumar, chair of the BMA’s board of science, welcomed the move which she said would come as a relief for many patients. She said BMA research had shown how “patchy or non-existent” the provision was, as well as the “relatively small cost” of providing tampons and sanitary pads free of charge. The charity Freedom4Girls, which campaigns against period poverty, said it was a “fantastic step forward”. The BMA is pressing for the move to apply to hospitals across the whole of the UK, although progress outside of England is already under way. In Scotland, free sanitary products are available in schools, colleges and universities, and a pilot to provide free products to low income households in Aberdeen is being rolled out. In Wales, a £1m government fund will help distribute free sanitary products via community groups, schools and food banks to those most in need, and in Derry, Northern Ireland, some public buildings are offering products free of charge.